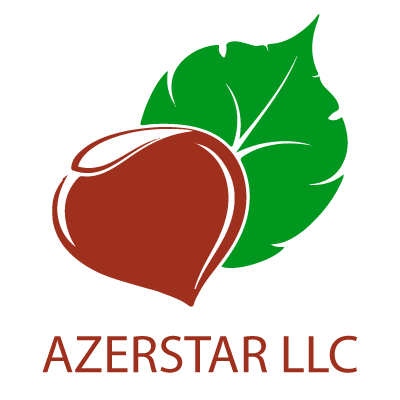 The AZERSTAR Manufacturing and Trading Company is one of the largest national hazelnut processors and exporters. Led by AZERSTAR founder Ilham Isayev, this small shop has grown over several decades into a large company with the impressive export volume of more than 4,000 tons of finished products per year. As of today, the company’s delivery capabilities have expanded to include the Commonwealth of Independent States (CIS) and most European countries. and an annual sales volume exceeding 22 million USD in 2018. Today, we produce and export up to 25% of the total volume of Azerbaijan hazelnuts,and our market share is growing annually since we are respected for both our quality products and our clear system of values. We process hazelnuts grown in the ecologically clean area of north western Azerbaijan. The factory employees control the quality of the product at all stages; the process of raw nut cultivation is controlled, as well. This is the key to our success. Such active cooperation with our friends, the local farmers, has enabled us to become a significant player in the European market of peeled hazelnuts. We systematically expanded our sales area; Zaqatala hazelnuts are already in most EU shops. We make important steps toward our partners; in June 2016, we opened a warehouse in Europe. We take care of our city; we support farmers and facilitate amenity planting in Zaqatala streets. We strictly control the compliance of our business management system with international standards. We use only the best industry equipment: color sorters, stone separators, and metal detectors made in Germany, Japan, and Turkey. In partnership with other exporters, AZERSTAR formed and took a seat on the management board of the Azerbaijan Hazelnut Producers and Exporters Association with an eye toward addressing yield quality issues and workingout a development plan for the Azerbaijani hazelnut as a whole. Welcome to our avenue for cooperation! Grow your business by supplying your country with good and healthy hazelnuts produced with love in Azerbaijan! The AZERSTAR enterprise differs from other companies due to its high quality products and its adherence to the requirements of international standards. The product is packed in a 40, 50, or 80 kg jute or in 40 or 1000 kg polypropylene bags as well as in 12.5 and 20 kg plastic bags that provide long-term storage and retain the quality of the products. Our company also utilizes 500 g lined bags and 100, 200, 250 g and 1 kg plastic sachets for retail sale. The processing of hazelnuts starts with cleaning and drying. Special modern equipment purifies raw materials by removing casual impurities and sorts out nonstandard hazelnuts automatically. Then the elevator and conveyor systems deliver raw material to the automatic dryers, which bring the humidity to within parameters of the established standards. After that, in the calibration area, hazelnuts are gathered into different bins depending on their size, which aids in the subsequent stage of processing. Two different types of equipment are involved in the process of separating the shells from the kernels of hazelnuts. Then shelled hazelnut kernels are sorted by size again. At the beginning of this stage,the final parameters of the prepared product are defined by industry standards and customer requirements. Passing through the diligently sorting women’s hands, the hazelnut kernel acquires its primary, marketable attribute: part of the kernels undergo deeper processes that enable us to provide consumers with the widest range of hazelnut products possible, including roasted, chopped, ground, etc. Hazelnut kernels are brought to the necessary humidity and degree of roasting in the heat treatment area. Hot air, brought to the necessary temperature,gathers in the automatic ovens. Afterward, roasted kernels are shelled due to the internal temperature reached. By means of photocells, the unit separates shelled hazelnut kernels from the remaining kernels completely. The prepared kernel, brought to within certain parameters set by customer requirements, undergoes cutting down to the size of 0-2 mm (flour), 2-4 mm, 4-6 mm,along with various other sizes as the customer desires. This entire process, from raw material to finished product,is under the constant supervision of employees hired by Physico-Chemical Laboratory, which has the essential equipment and experience for quality control and the proper storage of raw materials and finished products. Some of the key principles contributing to AZERSTAR’s stellar work performance are safety and the quality of the supplied products, and adherence to the strictest quality standards at both local and international levels is key. As part of the complex measures for maintaining our produced goods, AZERSTAR implemented a food safety system called Hazard Analysis and Critical Control Points (HACCP), which ensures absolute food safety along the entire chain of production and consumption, including preventing potential hazards, focusing on effective administration, and allowing our individuals to obtain information about regulatory and legislation changes on all the markets with which the company is involved in a prompt manner. Our enterprise adopted clear and rigorous standards for harvesting and processing to ensure control quality. Further, our company includes several production zones, which also contain branch offices in regions with rigorous sanitary regulations. The production and distribution of our hazelnuts is also a key part of the quality control process. All raw material supplied to the company is primarily tested in the company’s own laboratory. Laboratory tests are conducted in accordance with European standards for product quality assurance and are implemented at all stages of product processing right down to the finished product. Once approved by the laboratory technicians, hazelnuts are sent to sorting where they are cleaned out of debris that falls in during nutting. Hazelnuts with a specific humidity level are those fit for production;therefore, hazelnuts are dried to the required standard. Hazelnuts may easily get spoiled and lose their flavor if they remain excessively humid, so there are special cameras for storing dry hazelnuts so as to maintain the optimal temperature and humidity levels. Manually sorting hazelnuts is still the best way to provide quality results. The employees working on the sorting conveyor remove damaged and spoiled hazelnuts as well as hazelnut shells. Also, the employees are sorting these hazelnuts after undergoing hygienic hand disinfection with an alcohol-based solution. The production of food products requires strict observance of rigid sanitary rules. It is important to wear special gowns and caps while on the shop floor areas of the factory. A special, smooth coating is used for floors in the shop areas. Such coverage makes disinfection thorough. Monitoring occurs in all stages of production (checking temperature and humidity levels), and cleaning is held several times per day in accordance with our schedule. At the moment,the company has ISO 9001:2015 and ISO 22000 (Food Safety System Certification) certificates, which are recognized by the Global Food Safety Initiative (GFSI). Need the world's best hazelnuts?